To use bookmarks, you first need to make sure that both iCloud syncing and Use bookmarks are switched on in the settings. Once this is done, you can add a bookmark for any item in the news item view by simply clicking the bookmark symbol (the small heart). If you haven’t switched on the functionality, the symbol will be greyed out. Once clicked, you end up in the bookmark viewer; the actual look of the viewer will depend on your device and whether you are using portrait or landscape orientation. The viewer will show you a list of feeds for which there are bookmarks, and clicking on a feed will then show you the actual bookmarks. 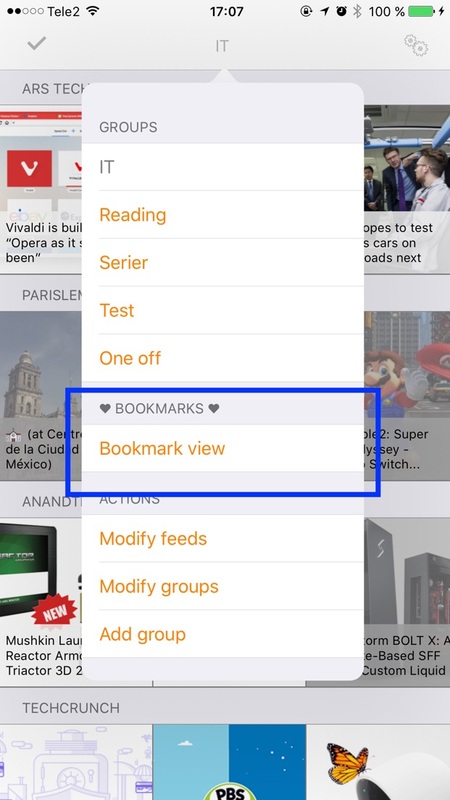 Clicking on a bookmark will then show the item in a view looking the same as the regular news item view; from here you can remove the bookmark (this can also be done by right-swiping in the list of a feed’s bookmark) or share it. Clicking on any link will of course open the web browser, just like the standard news item view. Double-clicking a bookmark will open it in your default web browser, with a look similar to the news item view. You are also free to delete bookmarks and feed folders from here as well; this will delete the bookmarks from all devices immediately. 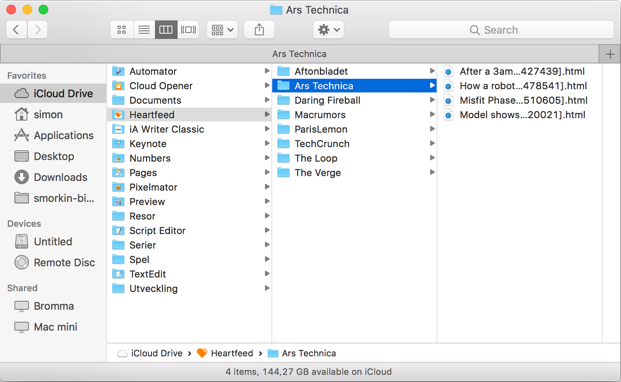 Similarly, if you download the iCloud Drive app to your iOS device, you can also see the bookmarks there, view them, and deleting them if you wish to. Note that all bookmark files have a number at the end of their names. This is necessary because sometimes multiple items in the same feed have the same name -> the number is used to distinguish them, internally.